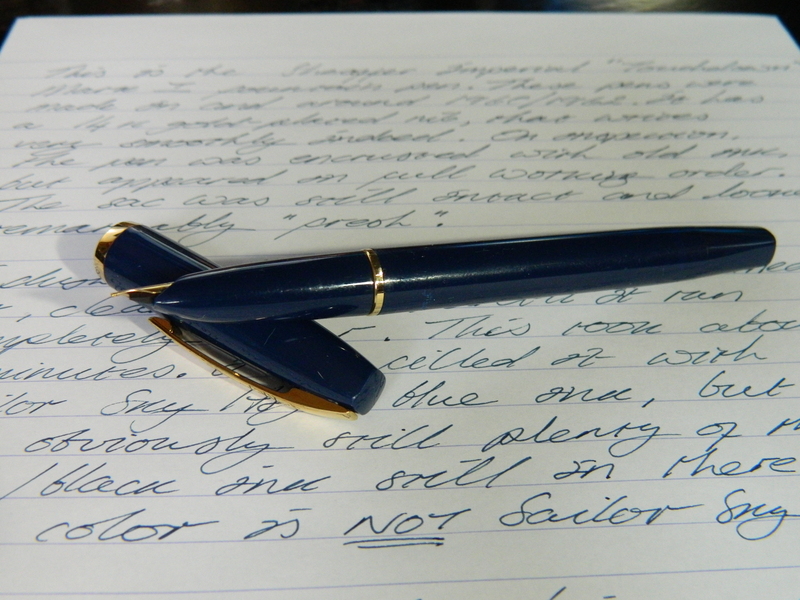 Some while ago, on a too rare visit to the UK, my mother gave me a fountain pen she had unearthed in a fit of cleaning out a long-ignored writing desk. 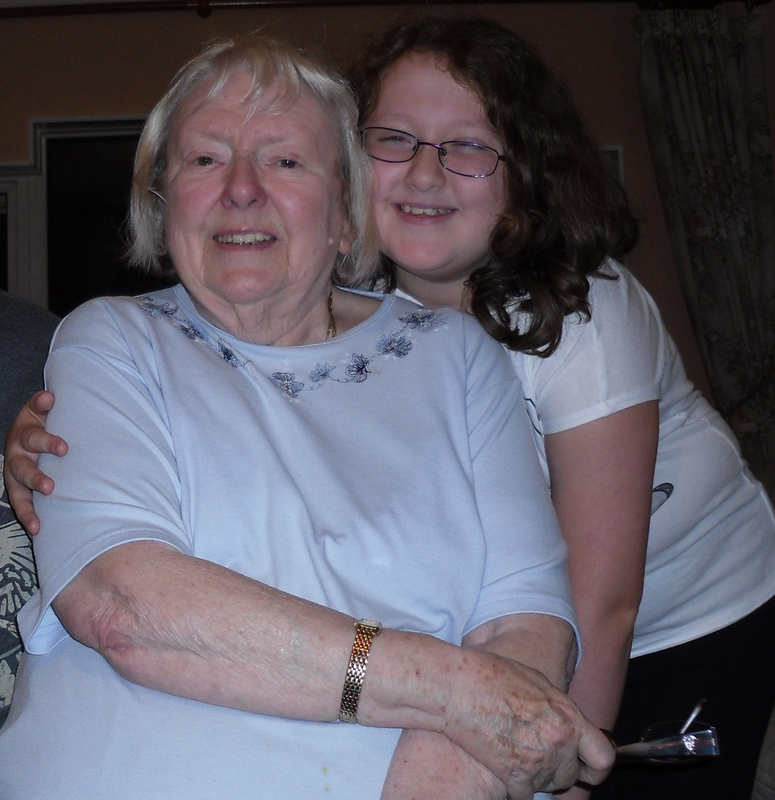 Well, it appears she’s been ransacking other items of old furniture, because—amazing lady that she is—she has found another treasure, and it arrived in my post-box only a very few days ago. She had warned me of course, so when I found this rather unassuming little black and gold cardboard box in a parcel from England, I kind of knew what to expect. The box is the pen’s original packaging, though sadly, no paperwork was included. It’s a bit flimsy and dry, but still serviceable and clean. 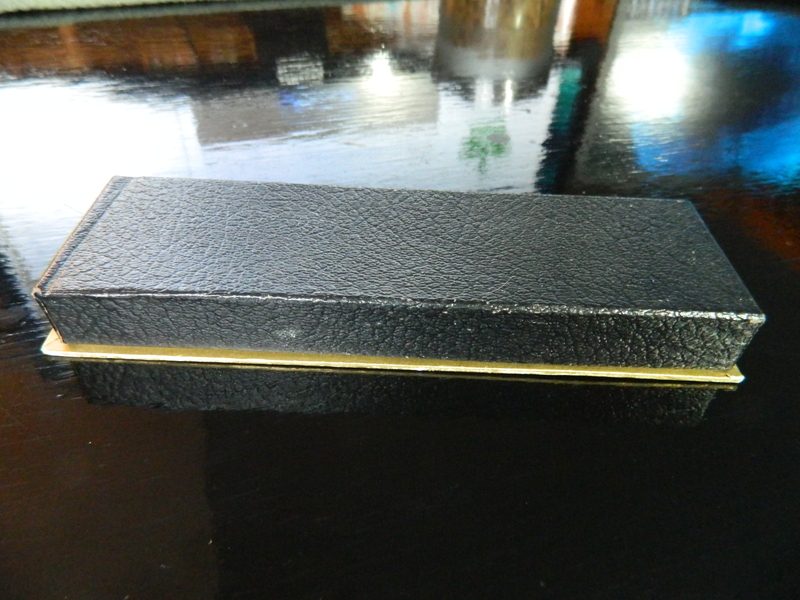 It’s hinged at the back, and grips the pen firmly in a molded cushion. 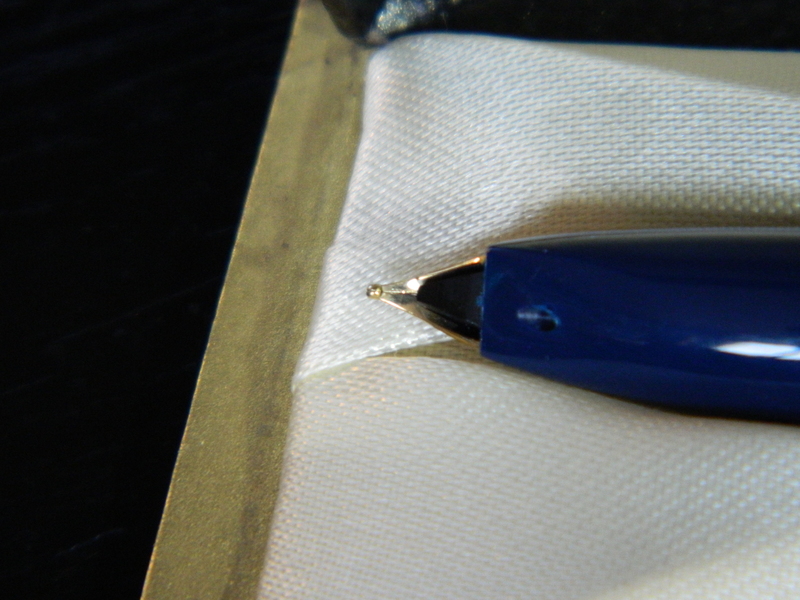 The pen is a navy blue Sheaffer Imperial I Touchdown, which refers to its’ pneumatic filling mechanism (more on that later). At first sight, the pen looked a little scuffed and worn, but closer examination revealed that, what I thought were scuff marks under the bottom line of the gold-plated, push-on cap ring, were actually faded lettering around the circumference of the barrel. 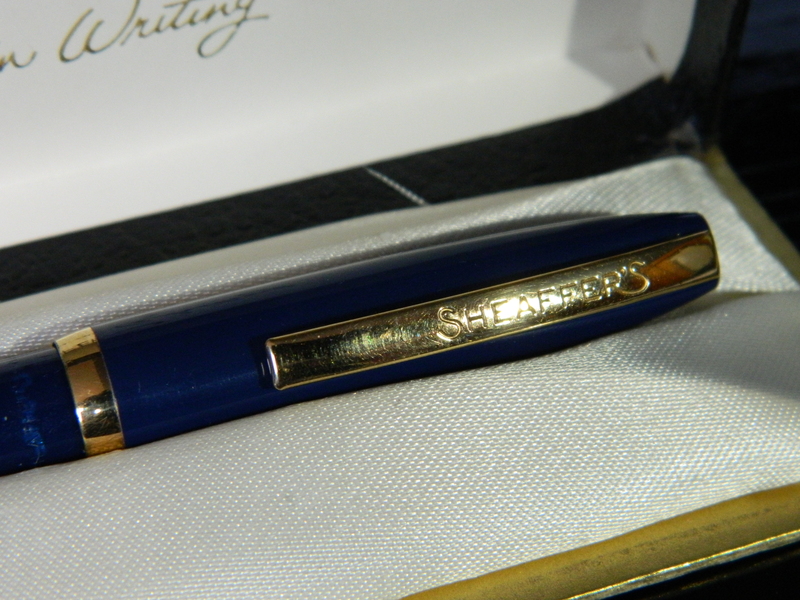 The lettering reads SHEAFFER’S Made in Australia, in what was a pretty fine print even at its best. Further down the barrel, was the—only slightly clearer—model name IMP. I, for Imperial mark I. 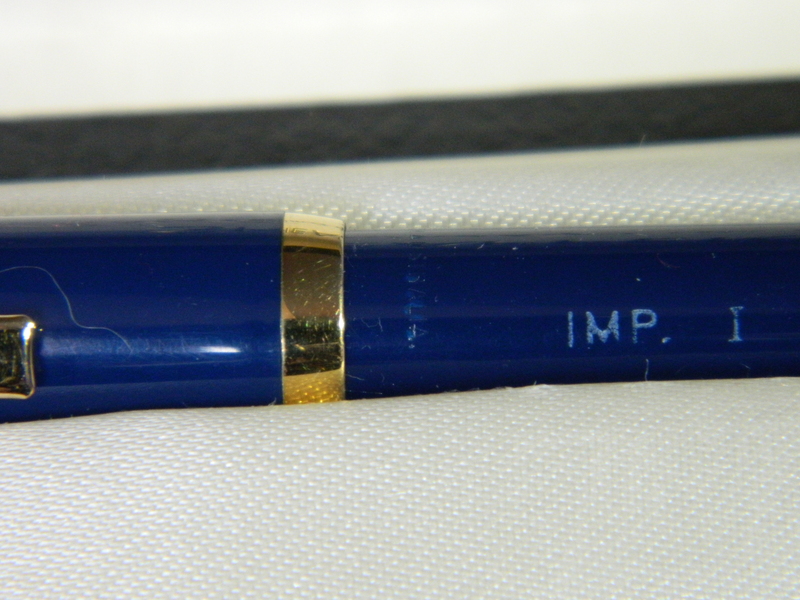 The Imperial I was made between 1961 and 1962, and was available in navy blue, black, burgundy red, dark green, and a blue/grey molded plastic. 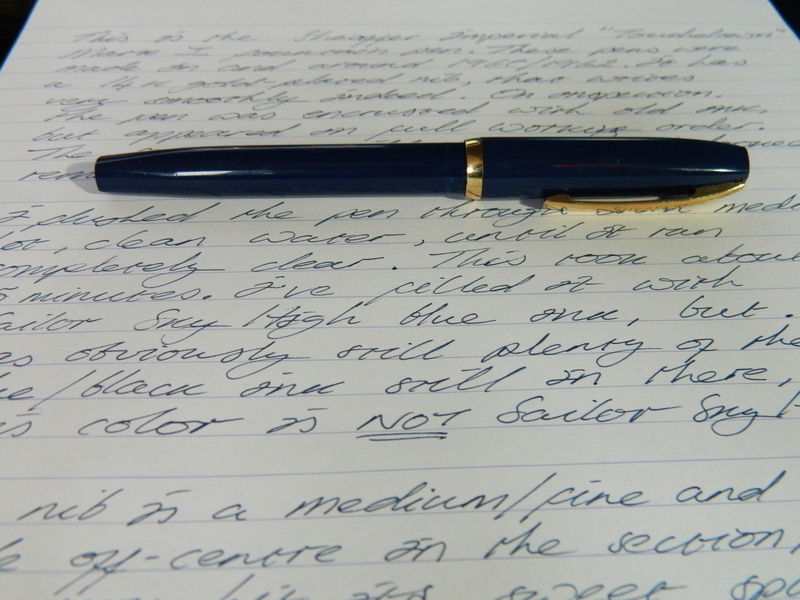 Nibs were available in gold, or gold-plated steel. My poor photography doesn’t do the color of the barrel much justice. It’s an attractive, rich navy blue, that has a timeless appeal when coupled with the gold-plated fixtures. Capped, the pen measures about 132mm (5.2in), uncapped and unposted it’s about 120mm (4.72in), which is about the same size as a Platinum Century 3776. It measures 147mm (5.79in) when posted, and is well balanced in the hand however you choose to hold it. The cap has a flat top, and a gold-plated ring at its opposite end. 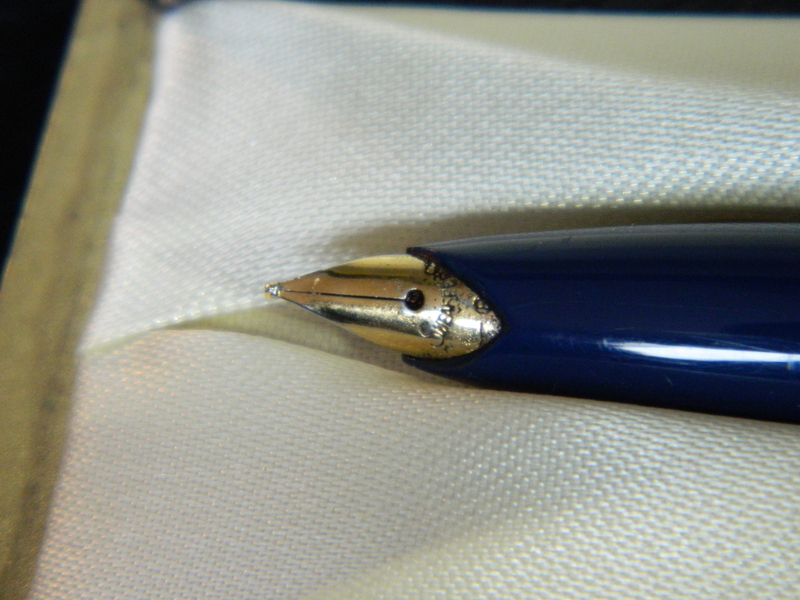 The matching clip is squared off, with the SHEAFFER’S branding part way down its length. 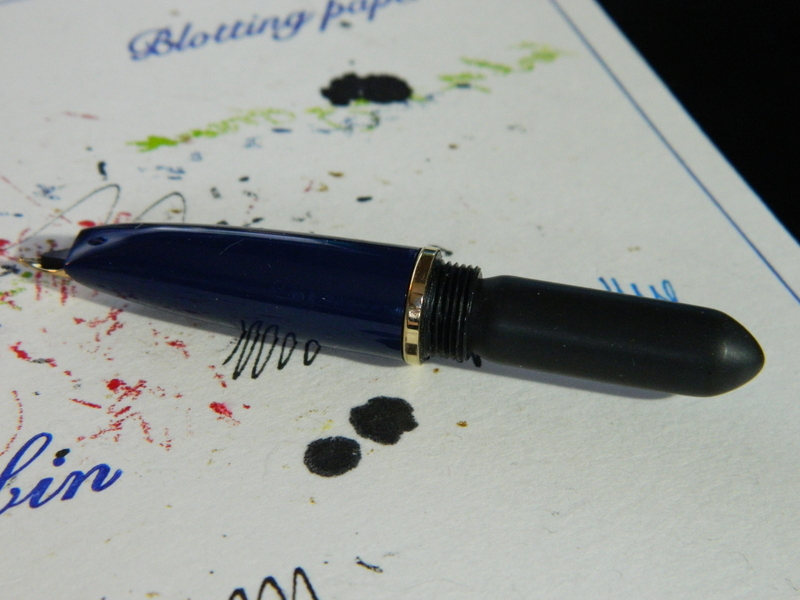 Under the cap, is Scheaffer’s inset Stylpoint nib, which is basically a semi-hooded, gold-plated, fine steel nib. 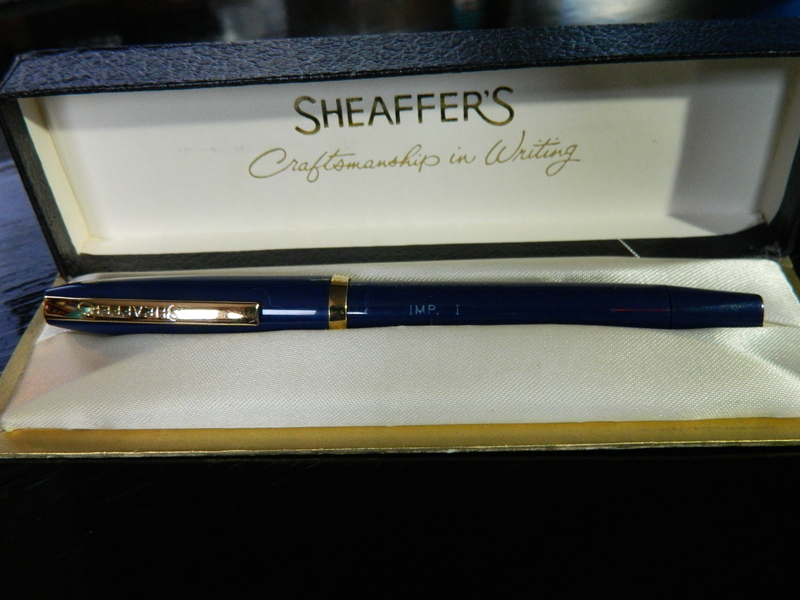 The nib bears the SCHEAFFER’S branding, and what appears to be an F for fine. 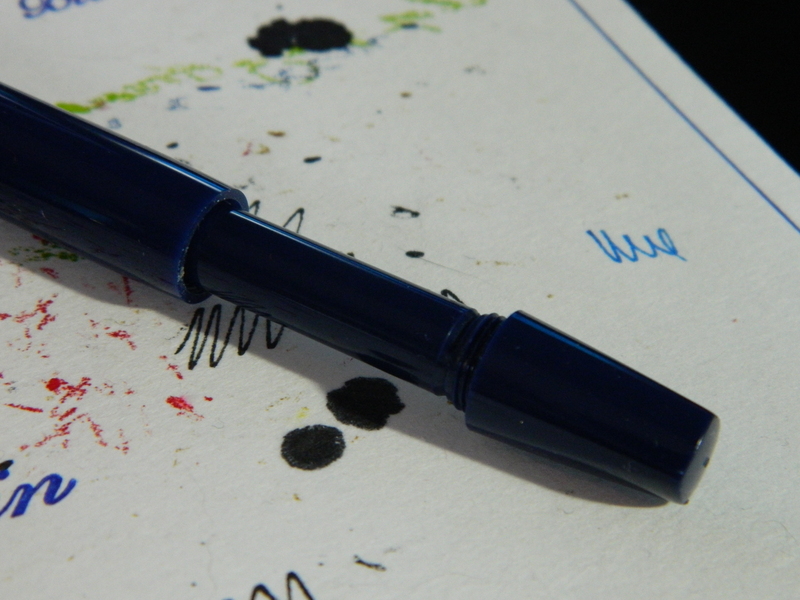 In this pen, the nib and feed also seems to have been slightly turned in the nib section, so that the breather hole and slit are not central to the line of the section. Regardless, this didn’t stop the pen from filling or writing. Note the small hole in the nib section, just below the feed. I haven’t seen any reference to this in my internet searches, but observation, and a stained facecloth, can bear witness to ink being ejected from here as part of the filling mechanism. At the opposite end of the pen, we have the blind cap, which is unscrewed and used to withdraw a cylindrical plunger from within the barrel. Once the plunger has been pulled out, the nib is submerged in ink—Touchdown. The plunger is then pushed back down into the barrel, which compresses a small sac attached to the end of the nib section. 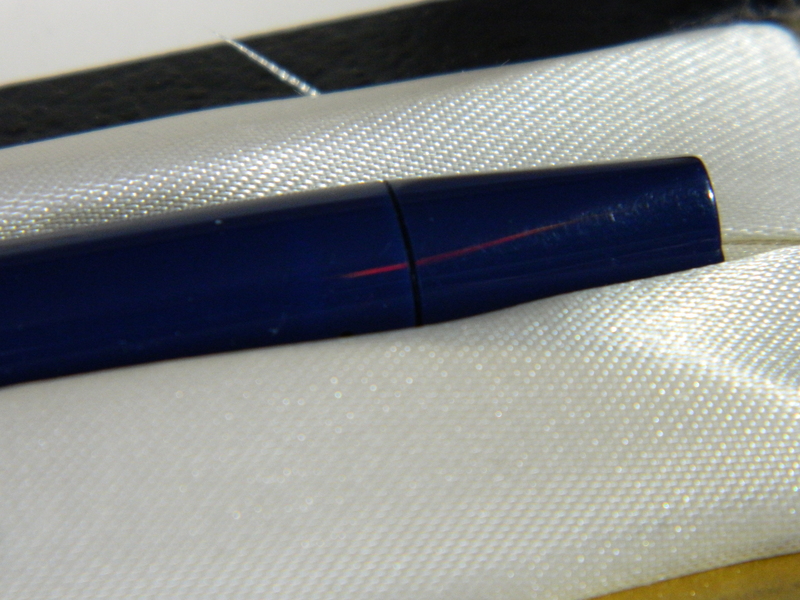 As the sac reinflates, it fills with ink over a period of a few seconds. 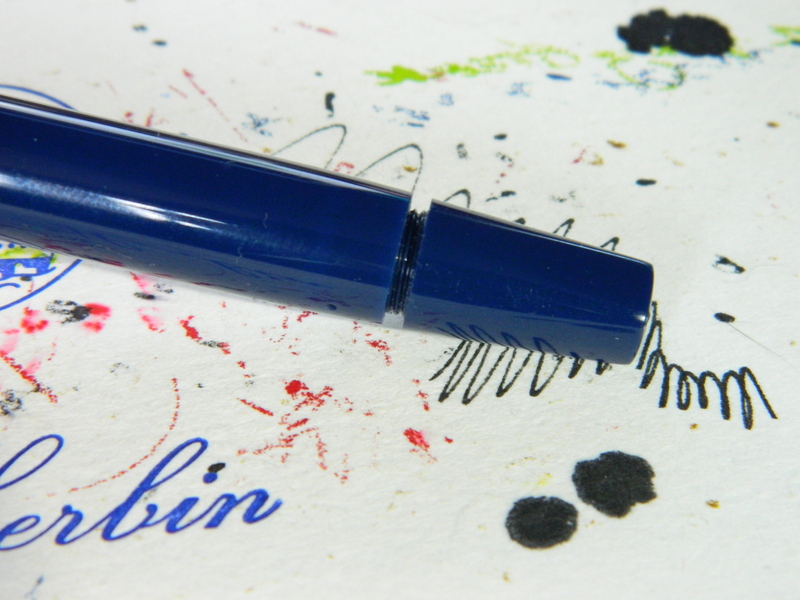 The nib can then be withdrawn from the ink, cleaned off, and the end cap tightened back up. When I got this pen, all of these parts were in remarkable working order for a pen that’s older than me (not by much, true, but it’s still older). In fact, the only thing I really had to do to get everything working nicely, was give the nib a good clean, and the sac a lot of flushing. Like I said, I cleaned it all out, I spent about 15 to 20 minutes flushing everything through, until the water coming out of the pen was crystal clear. I have to admit, even then I thought that 15 to 20 minutes was getting off a bit lightly, especially for a pen that had sat with drying ink in its guts for more than 50 years. 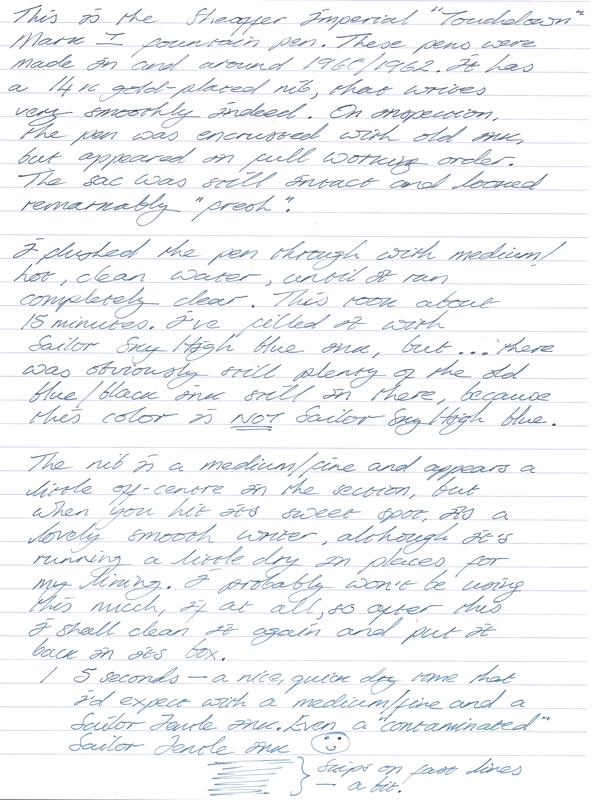 But I shrugged off my doubts and inked it up with a sac full of Sailor Jentle Sky High Blue, and set the nib to the white, 90gsm paper, of a lined Clairefontaine Triomphe notepad. Back to the kitchen sink, armed with a bit of 50/50 dilute white vinegar, some clean, tepid water, and an old electric toothbrush for getting into that nib and feed. Another half-an-hour later I tried again, this time on a Rhodia Dotpad #12, with 80gsm white paper. This time, the color was more what I would expect. Never give short-change on your pen cleaning. 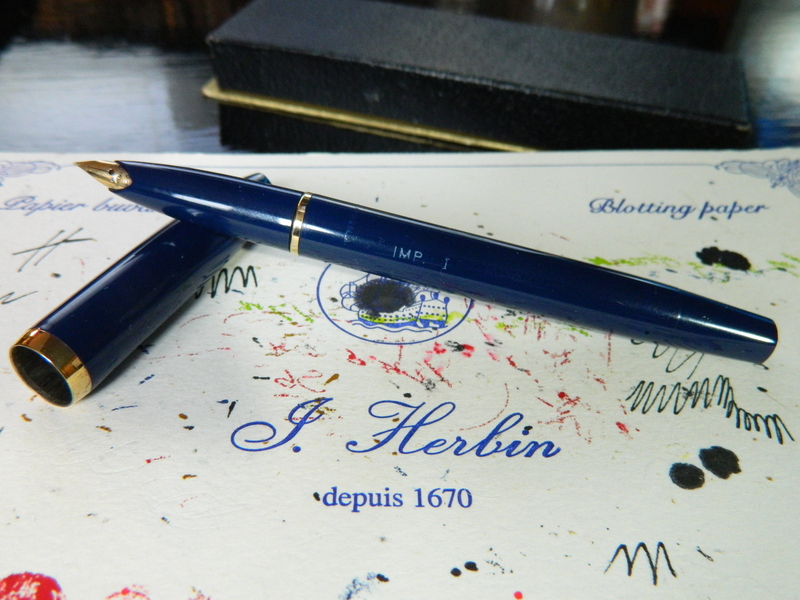 I like this pen, and although I have no memories of using it, like I did the Vintage Parker Harlequin that came from the same place, it still has value for me. The value simply lies in it being my mothers old pen; and I’m a sucker for family items with even a little history behind them. I’m not likely to use it again, in fact it’s already been cleaned and put back in its box, but the Scheaffer Imperial I is an interesting addition to my collection; if only for that Touchdown filling system, and a touch of family history. If you want to buy one, I’ve seen one or two on the web (2018-02-23) for about $90 (Australian Dollars; AUD). But these have gold nibs and look like they have been professionally restored. I’m not sure that you would buy a new, gold-nibbed, pen that writes as well as this one has for me, for that kind of price anywhere else, so I think I would have to say they’re good value at least. I have my late mother’s Touchdown. 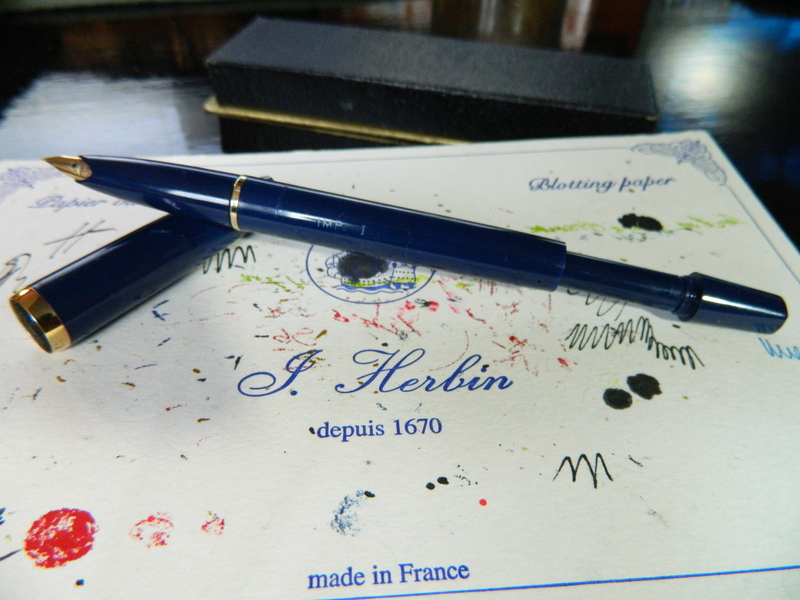 It is a Fort Madison US model, burgundy and with a more traditional style nib. I don’t know what year it was. 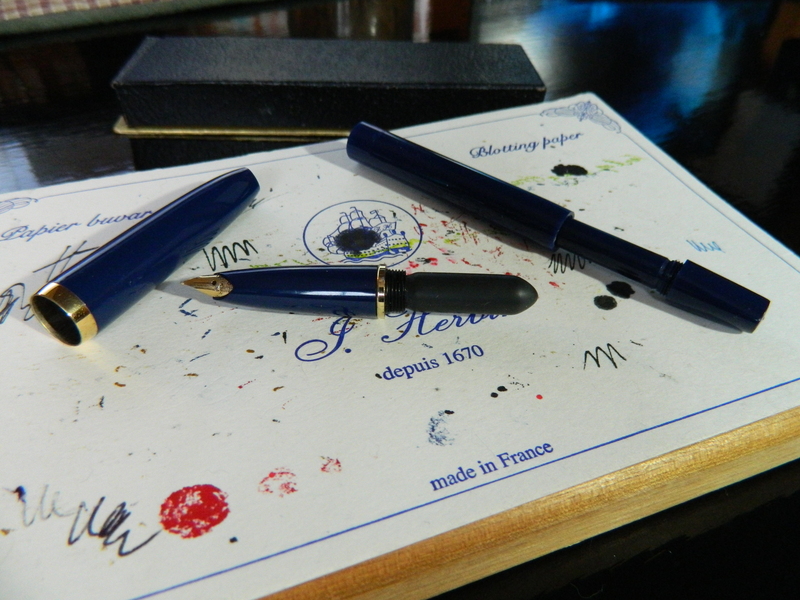 I like the sound of that pen, and a little family history, and fond memories, are worth more than any number of gold nibs.